A nomadic people known as the Khitan (Qidan 契丹) ruled China as the Liao Dynasty (辽朝) during the period 916-1125 AD. Charms from the Liao Dynasty are fairly rare and those with inscriptions can be difficult to decipher because the Qidan script is not well understood. Liao Dynasty charms lacking inscriptions are also a challenge to understand because the Qidan and the Chinese may have interpreted symbols differently. 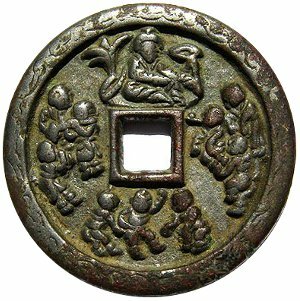 One of the best known of the Liao Dynasty charms is generally referred to by the Chinese as a “Mother of Nine Sons” (yi mu jiu zi 一母九子) charm. This charm has no inscription and relies solely on symbols to convey its meaning. Both bronze and iron versions of the charm exist. A very well-cast specimen of the charm is displayed at the left. 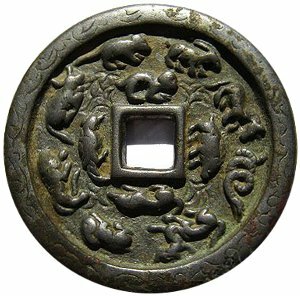 Chinese charm collectors have traditionally interpreted the figure above the square hole as being a mother riding a dragon. The charm also displays three groups of three people. They are believed to represent her nine children. The reverse side of the charm has the twelve animals of the Chinese Zodiac (十二生肖). Some collectors believe that the “mother” is Xi Wangmu (西王母), the “Queen Mother of the West“. Others interpret the charm differently. For example, an article published in the 2002.1 issue of the journal of the Inner Mongolia Numismatic Society (内蒙古金融研究) proposes that the charm’s theme is “nine sons become officials” (jiu zi sheng guan 九子升官). Another interpretation is found in a Chinese reference book on Liao, Xixia, Jin and Yuan Dynasty charms (辽西夏金元四朝货币图录精选) which argues that the person riding the dragon is not a mother but rather a son-in-law of a high rank. This interpretation is based on a Chinese idiom which translates as the “dragon-riding son-in-law” (乘龙快婿). According to a legend dating to the Spring and Autumn Period (771-476 BC), Princess Nongyu (弄玉), who was the daughter of Duke Mu of Qin (秦穆公), was so fond of playing the flute that she was only willing to marry a man with an equal love for the instrument. She eventually found such a man and their flute-playing prowess resulted in the two of them flying to the heavens with him riding a dragon and her riding a phoenix. Based on this legend, every traditional Chinese family with a daughter wished for a son-in-law who would be talented enough to pass the imperial exams which would guarantee a life of honor and wealth as a high government official. This is the meaning of a “dragon-riding son-in-law”. Those that accept this as the theme of the charm then interpret the three groups of three people as representing success at the three levels of the imperial examination system. A completely different interpretation of the charm is proposed by Mr. Pei Yuan Bo (裴元博) in an article published in the 2004.3 issue of “Inner Mongolia Financial Research” (内蒙古金融研究). Mr. Pei argues that to understand the true meaning of the charm one must first be familiar with a mythical story concerning Huangdi (黄帝), the “Yellow Emperor“, who returned to the Heavens by riding a dragon. Mr. Pei explains that Huangdi (2696-2598 BC) was the son of the “Celestial Ruler Supreme God” (Tiandi 天帝). The father decided to send his son to Earth to be a tribal leader “to temper him through hardships and tribulations”. While on the Earth, Huangdi battled the Yan Emperor (Yandi 炎帝). He invented clothing, carts and boats. Chinese characters were invented during his reign. He did much to improve the lives of the common people. He gained the support of the various tribes and became the chief of the tribal union. Tiandi was so satisfied with his son’s achievements that he sent a dragon to bring Huangdi back to the Heavenly Palace to succeed him on the throne as the central deity. Mr. Pei interprets the three groups of three persons as representing the “Nine Provinces” (jiuzhou 九州), a poetic name for China, celebrating Huangdi’s ascension as the king of the heavens. With this as a background, Mr. Pei proposes why this Liao Dynasty charm was created. When the Liao Dynasty was established in 907 AD, Emperor Taizu (yelu a bao ji 耶律啊保機; Great Khan Abaoji 907-926 AD) was regarded by the Khitan people as the son of Tiandi, the “Celestial Ruler Supreme God”. Emperor Taizu’s ascension to the throne was thus seen to be the same as when Huangdi ascended to the heavens to become the central deity several millenia earlier. The three groups of three persons each represent the “Nine Provinces” celebrating Emperor Taizu’s ascension. In the group to the left of the square hole, one person is playing the flute while another is beating a drum. The group to the right of the hole appears to be dancing and gazing at the sky. One member of the group below the hole seems to be pointing upwards while speaking to the others. The overall scene evokes a feeling of joy and celebration. As mentioned earlier, the reverse side of the charm displays the 12 animals of the Chinese Zodiac (十二生肖) which, according to Mr. Pei, is a metaphor for “all the people” since everyone has to be born under the sign of one of the animals. Moreover, the animals are all revolving around the “center” (the square hole) which represents the “central authority” whom they all must serve. Mr. Pei summarizes that the charm was created to show Emperor Taizu ascending to the throne by riding a dragon in a manner similar to that of the “Yellow Emperor”. The people, represented by the nine individuals (“Nine Provinces”), are expressing their joy and acknowledging his authority (Zodiac animals revolving around the center). Mr. Pei thus concludes that the theme of the charm should be the “prince rides the dragon” (tianzi cheng long 天子乘龙) instead of the “mother of nine sons”. As a final note, it is not surprising that a Qidan charm might claim some connection to ancient Chinese culture. Emperor Taizu adopted certain reforms from the Chinese which tended to move Qidan society towards cultural assimilation with the Chinese. Also, the Liao Dynasty was founded just as the great Tang Dynasty was collapsing and it was quite common for non-Chinese rulers to claim ancestry to the Yellow Emperor to enhance their prestige and status.